The Department of Natural Resources is stepping up efforts to limit the movement of firewood. 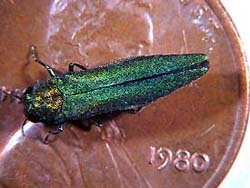 The discovery of the Emerald Ash Borer in Wisconsin is renewing calls to not move firewood when visiting state camping areas. The DNR&apos;s Andrea Diss-Torance says the agency is working to remind campers that firewood bought outside of a 50-mile radius of those sites will not be allowed into parks. The rule applies to all parts of the state, not just those near the quarantine areas . Diss-Torance says officials are concerned that EAB or other invasive species could hitch a ride. She says campers found violating the rule will have their firewood confiscated. The wood is bagged and then destroyed at the end of the growing season. Diss-Torance says park officials have had to confiscate a lot of firewood. The most heavily visited sites in the state have seen the most wood taken in. However, she expects more visitors to follow the rule as word of the Emerald Ash Borer&apos;s presence in the state continues to spread. Firewood is available for sale at most state camping areas.